While the term “Power Pop” may have been coined by The Who’s Pete Townshend, the musical blueprint for the genre can be traced directly to The Beatles. In the 50+ years since The Beatles changed music history, many bands have attempted to follow the Fabs’ blueprint (The Knack, The Pinkees, The Spongetones, The Flying Elephants, etc. 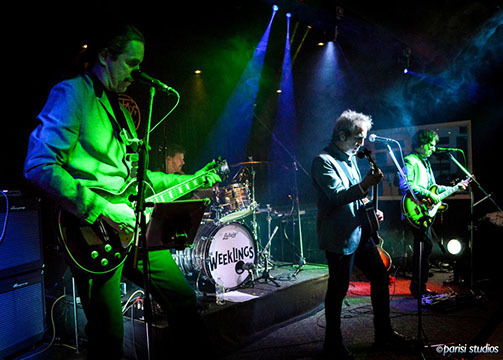 ), pay homage to the legacy of the Fab Four (i.e., The Rutles, Utopia’s DEFACE THE MUSIC), or go the ‘tribute’ route and perform the songs of Lennon, McCartney and Harrison (Beatlemania, Rain, Liverpool, Britain’s Finest, The WannaBeatles, etc). New Jersey’s The Weeklings, however, decided to take the most difficult route of all: do all of the above! Made up of four exceptionally talented individuals (see below), The Weeklings is a labor of love for all involved. 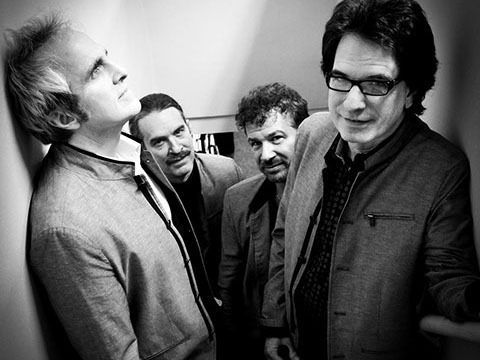 Recreating the sound of early to mid-‘60s era Beatles is their forte, but what they do with that sound in adding to the Power Pop legacy is what makes them special. Which brings us right back to the term Power Pop. Are The Weeklings Power Pop? Some would say no, but they possess all the traits of being one of the finest modern Power Pop bands in the land. I suppose the verdict is really up to the listener... but I strongly urge you to vote "YES!" on that initiative! For some, the main draw will be The Weeklings’ performances of songs written by John Lennon and Paul McCartney but not actually recorded by The Beatles. Their original compositions alone, however, are most definitely worth the price of admission. 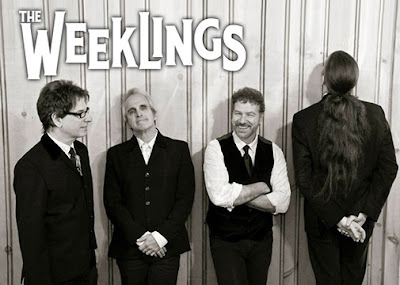 More like a cleaned-up version of Scotland’s The Kaisers, and less like the glorious parody that was The Rutles, The Weeklings’ originals are inspired by the Merseybeat sound, but are more than simple re-writes of classic Beatles tracks. Their 2015 debut album, MONOPHONIC, was one of the finest albums of that year, with six original songs and six Lennon/McCartney/Harrison songs. Not surprisingly, their sophomore album, STUDIO 2 (recorded at Abbey Road!) is even better, and is a step forward rather than a rehash of the debut album. STUDIO 2 wisely features eight originals and only four rare Lennon/McCartney-penned tracks that were never performed by The Beatles (the cassette version of the album adds three Beatles classics). 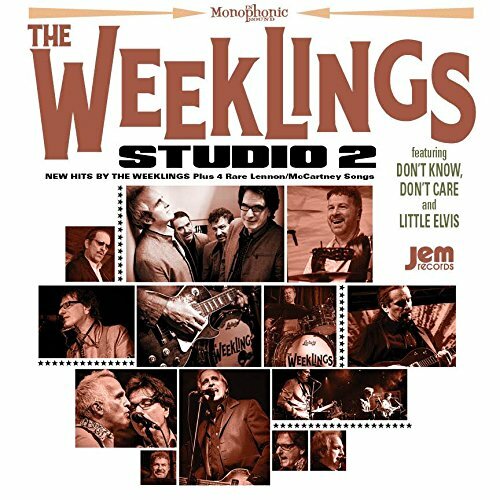 And the Weeklings’ originals on STUDIO 2 are top notch, the highlights being the blissful Pop of “Love Can” and Merseybeat rockers like “Don’t Know Don’t Care” and “Morning Noon & Night.” Ironically, these spirited originals are more instantly lovable than the songs they cover at the end of the album! LEFTY WEEKLING (aka GLEN BURTNIK): I play bass, some other stuff (piano, guitar) and sing. ZEEK WEEKLING (aka BOB BURGER): I play rhythm guitar, and also other stuff (harmonica, bass) and sing. ROCKY WEEKLING (aka JOHN MERJAVE): I play guitar – 6-string mostly, 12-string occasionally, 4-string rarely and bouzouki once, only on the first album. I sing a little, too. SMOKESTACK WEEKLING (aka JOE BELLIA): I play drums and sing. LEFTY: After enjoying the experience of our debut album, we wanted to kick things up a notch. Seeing as how heavily Beatles inspired we are, we thought we’d book time at Abbey Road Studios and cut in the same room they made all their music in. In addition to our original songs, we included a few bonus tracks of very rare Lennon-McCartney songs, three of which have never been properly recorded nor released by any act at all. ZEEK: What Lefty said. We again went for capturing the spirit of the ‘60s recordings, by recording live in the studio as much as possible, and using the original vintage gear. Compared to our first LP, we moved this one forward in time from 1964 up to 1965. Back in those days, you could hear the difference in a year’s time! The songs are somewhere just shy of Rubber Soul. Our first record was more like Meet The Beatles..
ROCKY: I think each song speaks for itself and stands on its own, so it’s quite difficult to pin down one that defines the essence of the album or the band, for that matter. SMOKESTACK: Studio 2 was a labor of love. We worked hard on it. We are very proud of the results! ZEEK: Hopefully none of them. It’s a moving target (especially what the band is about). The band favorite song seems to be “Love Can”, but it doesn’t really represent the whole record. It’s a mid-tempo, delicate song, whereas most of the others are rockers. SMOKESTACK: “Morning Noon And Night”: the first song lets you know what to expect. LEFTY: Only slightly did I ever consider the overall album vibe of this one myself. I knew we needed a certain amount of up-tempo songs balancing ballads, etc., but it’s pretty much the record of where we’re at now. ZEEK: They are individual songs. It’s not a concept album. What ties it together is vibe of the players and the way we recorded it. It definitely has a vibe. But I think that is simply the result of where we are right now, and the process we applied. SMOKESTACK: We recorded 16 tracks at Abbey Road and then picked the songs that fit the vibe we were looking for. LEFTY: I kinda think we knew. ZEEK: We had a target in mind, but at the same time it did form itself. You never really know how an album is going to come together and until you’ve got the final package. But I think we accomplished what we set out to do. I might add that we recorded a number of songs that we left off the album because they weren’t meant for this one. LEFTY: We work together swimmingly. ZEEK: It is pretty smooth. Sure, there is a lot of give and take. There are so many good ideas offered. Creating and making an album is really the best part of the gig! ROCKY: Absolutely a group effort. Someone brings in a demo, we knock it around, and it becomes a Weeklings song. LEFTY: I’m happy. I used to belabor over every single note on my solo albums. Now I am free! I’ve been Weeklingized! ZEEK: You always feel that way somewhat, no matter how much time and effort you put in. But I really wouldn’t want to go back and change anything. It’s what we did. ROCKY: Someone asked me just tonight as we were listening to the CD, “Do you wish you could have done anything different?” In the past, I’d be criticizing every note I recorded, much like Lefty. But my answer tonight was simple: “No. It’s done. It’s released. I’m happy!” And that’s the truth! SPAZ: Can you tell us a little about recording your album at the infamous Abbey Road studios? How did that come about and what was the general feeling when recording the album? LEFTY: It was like a bucket list item for me. Eventually, the other members joined me in my dream. Then we made it happen, with help from crowd-funding. We are happy, fortunate rock gods. ZEEK: Something I never imagined I would do! It was so much fun! Such a top notch organization and so easy to work with. Forgetting the fact that the Beatles recorded there, it was just a great recording experience of its own merit. SMOKESTACK: Recording at Abbey Road was a dream come true. Very inspiring. LEFTY: Besides Donald Trump’s rise to power, the only thing I really recall was the band working on music and playing fun gigs. ZEEK: We’ve been pretty influenced by Buddy Rich’s tirades. One of my favorite things about the band is the (sometimes very dark) humor. I think it’s very much part of the record. ROCKY: Initially, it was just a dream come true for me, being such a Beatles fan. But, over time, as we were preparing for the trip, many fans would come up to me and say that they were proud of the band making the trip over and recording at Abbey Road. They were sort of travelling over there with us, in spirit. So, that just made it a little more special. SMOKESTACK: While rehearsing the material. LEFTY: During the second day of recording in studio 2 I felt like, ‘Holy crap, this is sounding very good’. ZEEK: During recording, I was so concentrated that I didn’t have time to think about that. I think it’s only now with the fan reaction, and getting some distance does it seem like maybe we did do something special. ROCKY: I remember a very special moment when, while down in the studio recording the 12-string guitar on “Morning, Noon and Night”, I called up to our engineer (Toby Hulbert) and asked him to get the guitar to sound more like George Harrison’s. He did what I requested. When I went back up to the control room, I noticed that the guitar signal was going through one of the original REDD mixing consoles used in Abbey Road back in the mid-‘60s which was then patched through one of the studio compressors that was used in the ‘60s as well. (A Fairchild Model 660, for you tech geeks out there). That’s exactly how they recorded George’s guitar. That blew my mind! LEFTY: We record Weeklings album #3. We are considering naming it Plagiarism. ZEEK: Yes, next record! But we’re also playing a lot more and getting to be an even tighter performing unit. Hopefully, we will split our pants. ROCKY: I’m hoping we could tour a bit more and get the music out there to different audiences. And, of course, get moving on the third album! LEFTY: STRANGE DAYS and WAITING FOR THE SUN by The Doors, Dave Clark 5/ GREATEST HITS, RAINBOW ENDS by Emmitt Rhodes, “Machine Gun” by Jimi Hendrix, LOVE YOUR MOM by Denny Braendel and the ETHEL MERMAN DISCO ALBUM. ZEEK: “America” by Yes! I try to listen to new stuff and listen to the radio. Hard to do sometimes! But I do listen to XM Deep Tracks a lot too. Newer bands I like are Kongos, The National and The 1975. Can’t believe he (Lefty) listed Denny Braendel! ROCKY: SGT, PEPPER by The Beatles, ARGYBARGY by Squeeze and Studio 2 by The Weeklings. #WeeklingsMania is alive and kicking! This band is both skilled and funny, a perfect combination! Thank you for reading the feature and taking the time to comment. And yes, I agree... GREAT band!